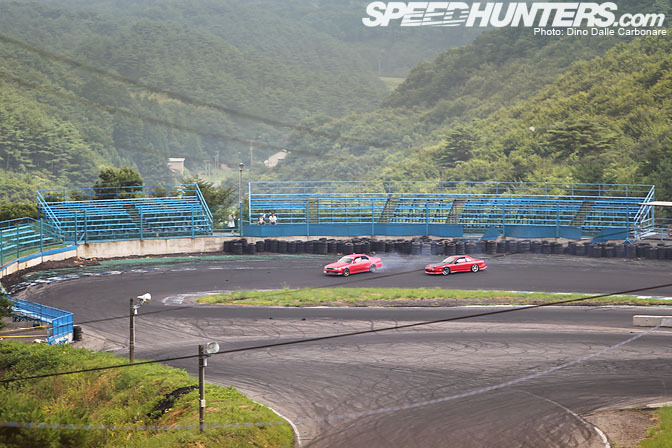 The Drift Matsuri is as much about atmosphere as it is about actual drifting, which is probably what makes it such a unique event. Compared to previous ones I have visited and covered this past 2010 Summer edition was definitely quieter, with far less drifters making the long journey to Fukushima-ken. Blame it on timing, a week after the Japanese Obon holidays most people take time off for, or the scorching hot weather, which just makes it hard on drivers as well as the cars. 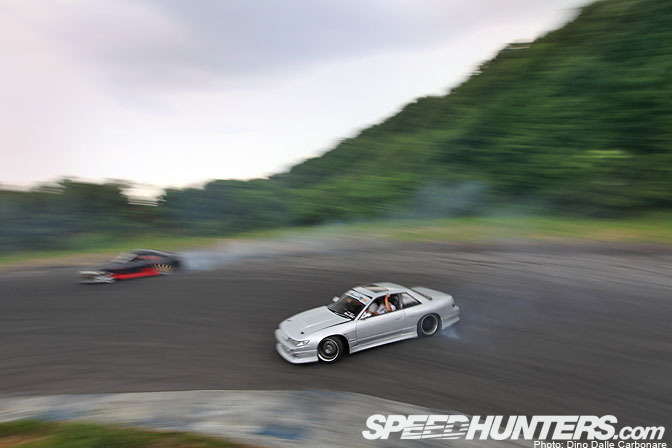 But the lack of locals was made up for by an unusually high participation of foreigners, mostly Australians, who made the long journey over to Japan to dive headfirst into the Japanese drifting experience. With the second round of the 2010 G1-GP held on Friday, the day before the Matsuri kicked off, most got their fair share of action with the drift cars that Andy and Emily at Powervehicles had supplied for most of them. 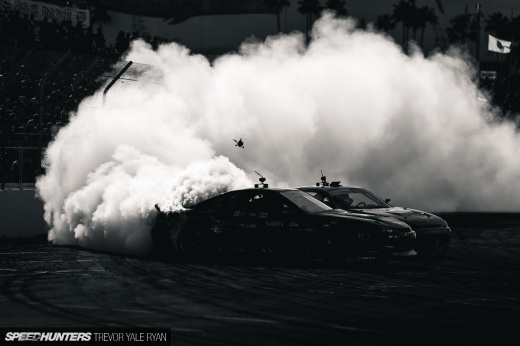 With three full days of non-stop drift footage there is tons I want to share, so sit back and enjoy this first installment of pictures as I tell my story of yet another tire-smoke-filled and pit-wall-hitting weekend! For this event I was once again back on the blisteringly quick Powervehicles ATV, which allowed me to not only move from one circuit to another very quickly, but also give me action to some very unique shooting locations I had never took advantage of before. 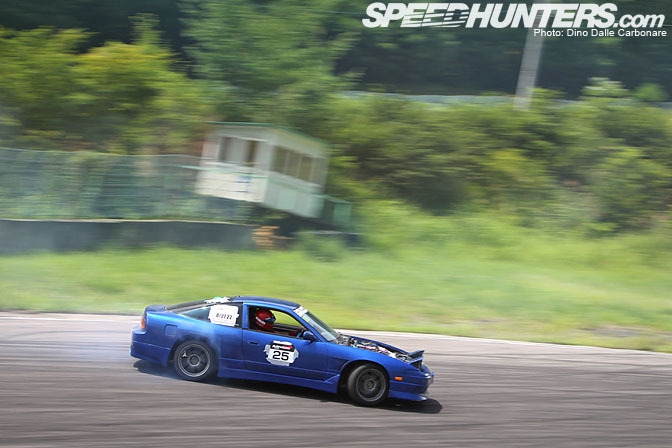 Like this shot of D1 driver Naoto Suenaga, out on the back section of the Nishi course during Saturday afternoon as he enjoyed himself with his 180SX practice car. Notice the perfect clip of the apex as he flies by at the top of third gear completely crossed up. 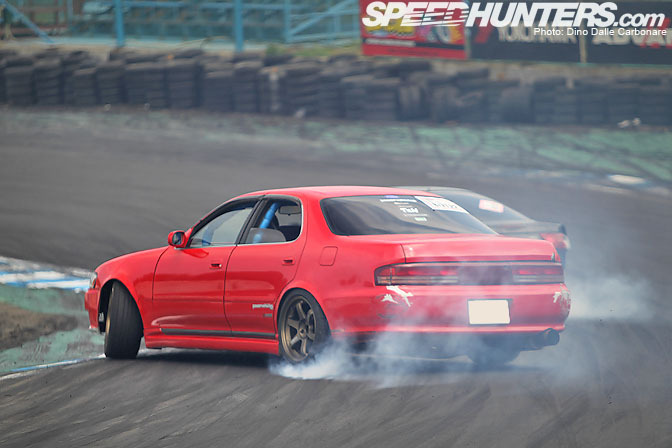 The winner of the G1 GP, professional drifter Leighton Fine, was in top form getting the most out of his nice JZX90. This shot was taken up in the North (Kita) course as he flew in very sideways practicing aggressive entries. David aka "Shiny" was determined to take out as many of the plastic bottles that had been laid out on the Kita pit wall. After a bit of practice, and edging closer and closer each time, he got the hang of it as you can see! After waiting for the action to get into gear early Saturday morning I headed down to the East (Higashi) course to see what was happening. Like all other tracks the paddock were half full with only a dozen or so cars parked up in the pits. The action was limited too, but it strangely felt right, the lazy pace of this Matsuri being a perfect match to the hot and sunny summer weather. The lack of action at times was the perfect opportunity to find a nice cool spot in the shade to take a breather and grab a drink. Leigh Pidwell was having a blast with his Tourer V going at it 100% every time I saw him at each of the four main tracks. He even got to do tandem runs with Daigo Saito in Minami so to say he was satisfied from the weekend is a massive understatement. 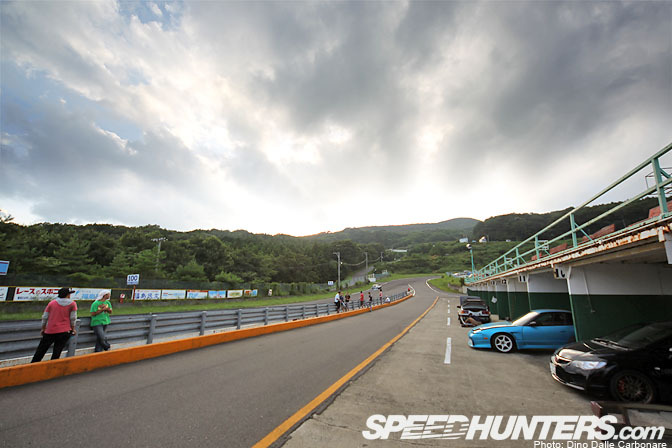 Higashi is by far my favorite track to shoot at in Ebisu, it just has the nicest backdrops that seem to change so dramatically with each season. 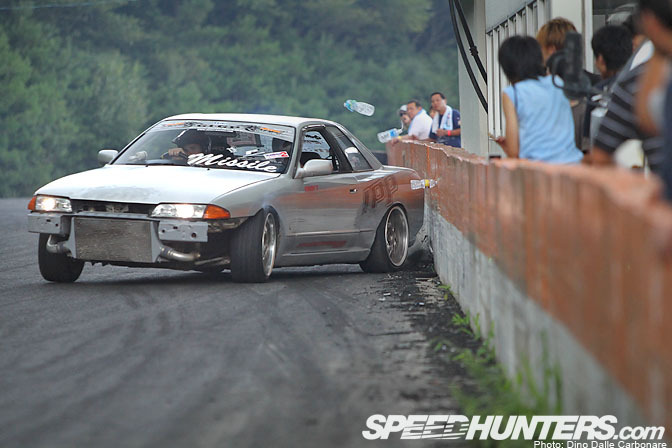 As I was shooting from the inside of turn one at Higashi I noticed this RPS13 entering the corner at ridiculous speed. I later found out it was Koguchi taking the car for a drive. 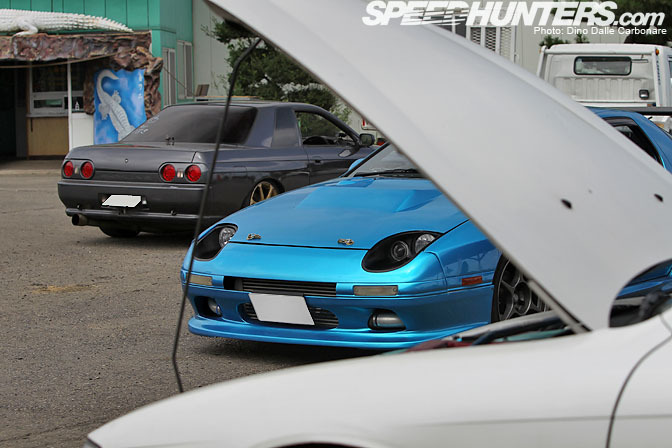 He was there with a blue S14, as we will see in the next post or two. On my search for action I moved up to the North course where there were only about 5 cars parked in the paddock. 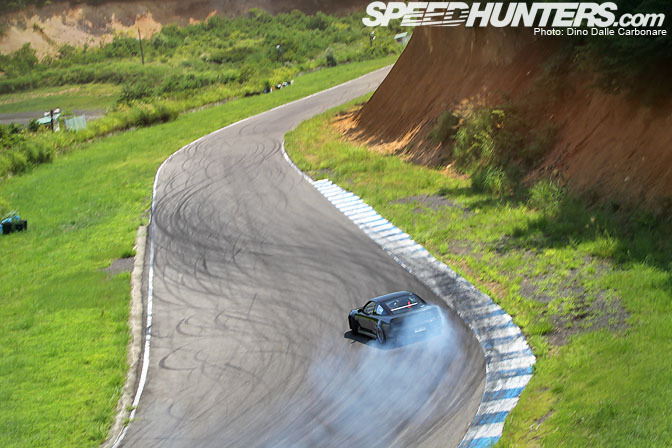 The only one out on track was this AE86 practicing the entry to the first corner. 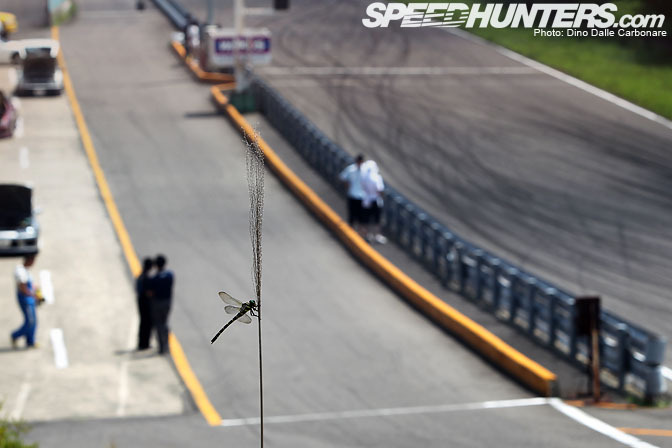 This is not the kind of view one would expect to see in the South course (Minami) paddock during a Matsuri! I was really beginning to get worried but eventually more cars began to show up by the end of the day. 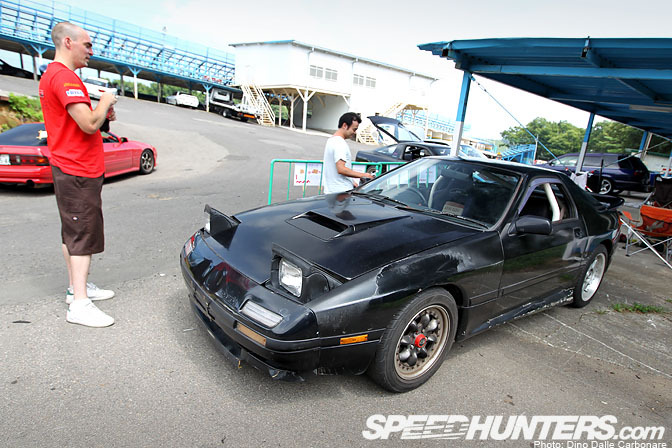 You can always expect to see this pair of Nissan missiles at Minami. …had been cunningly modified with its original grill and headlights, neatly mounted on top of the roof. Notice the wiring! You got to see at night somehow right. Andrew Sunderland from Australia was back in his JZX90 missile and as ever going flat out at Minami practicing that D1 line. Seeing the action hot up Andy of Powervehicles quickly went up to his garage to pick up his red JZX90 Cresta and went out for a few tandem runs. It was definitely fun to watch, even from far away! 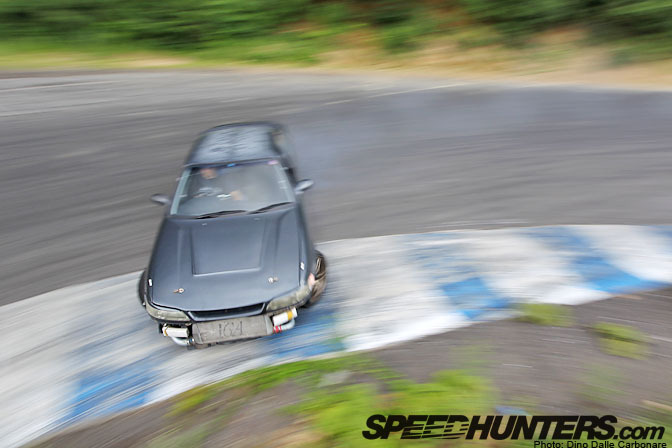 The Drift Land course is always one of the busiest places that both beginners and more proficient drivers go to for a bit of practice. While taking a cool-off break under the covered pits I couldn't resist snapping a shot of this white T&E kitted S15. 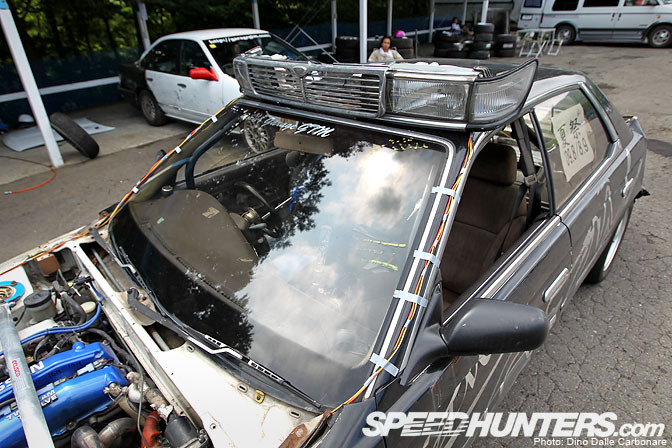 Now that's a curious headlight conversion for the FC! …this menacing chameleon purple SXE10 fitted with a pretty wild front mounted intercooler. Power comes from a tuned 2JZ just like Sagisaka's D1 Altezza. Too bad I never saw it out in action! Nishi was by far the busiest place with a lot of guys from the Yokota Air Base out for a play. I especially liked this Cefiro on black Work Meister S1s and work-in-progress wide front fenders! Stance anyone? Kita in the afternoon resembled an Australian drift championship with Chris DeJager and Christian Pickering going at it with some pretty impressive passes. Then Chris started to do things that people had never seen before. You guys remember the famous Kawabata rear-end entry at Okayama? Well Chris, who now lives a stone throw's away from Ebisu Circuit, has become quite the master at making his car look like it's going to spin but then pulling out of it with a boot-full of power. Physics defying stuff! 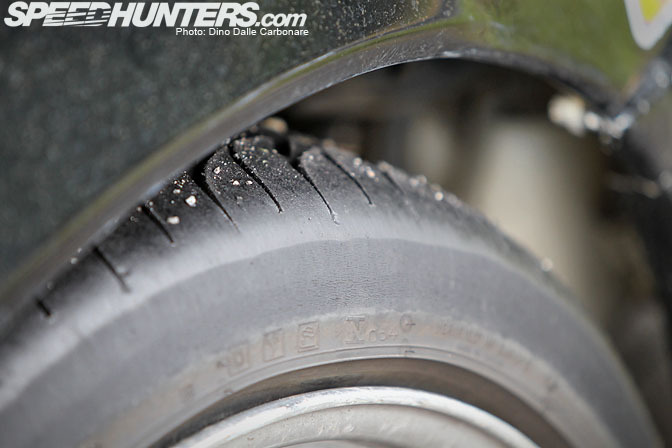 These crazy full-lock entries do weird things to the front tires as the cambered and castered out front wheels scrub the sidewall along the tarmac. There was no way of knowing the brand of the rubber after he was done! The minute I saw Saito arrive with his transporter and get his crazy battered up missile unloaded I knew this Matsuri was going to step up a gear. You will have to check back for Part 2 to see what D1's craziest driver got up to in his practice runs. As the sun dived behind the mountains it wouldn't be long until the night time action got under way. More in the next post! I like how there are some drivers in the drift world who really take care of their cars and there are others who don't seem to care at all. 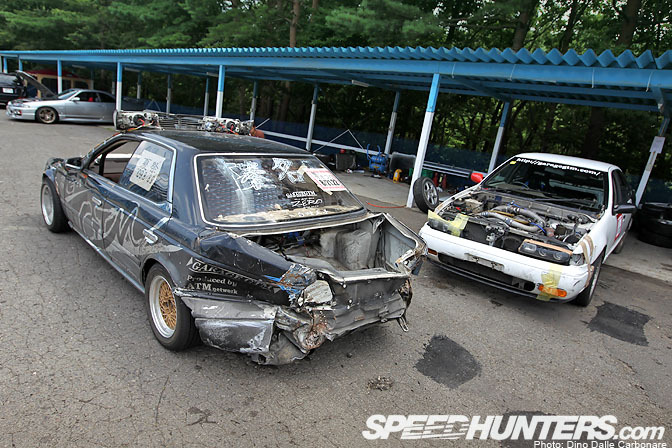 love the totaled drift car, dedication! Holy crap, that's my car! Sell my Mark II back to Andy and not two months later it's winning competitions. Hope it survived the rest of the weekend! 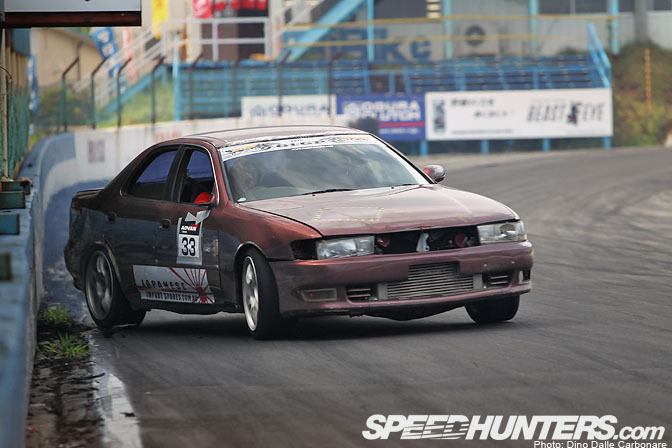 Dino, do a favor for another ex-Ibarakian and put up a wallpaper of that winning JZX90! The SXE10 needs his headlights scrubbed and that clean s15 makes me hate import laws. Insane pic of chris. need some video on this action. Nice . Just nice . That second shot makes me dizzy. Would like to see that roof lit Laurel at night! I think everyones life would be better with a desktop of the first picture. Can we please have the 1st picture as a desktop? That first picture needs to be a desktop...along with many of these. insane pictures, like always Dino, greats photos ! The blue RPS13 looks like Christy Carpenter from Ireland...anyone know? 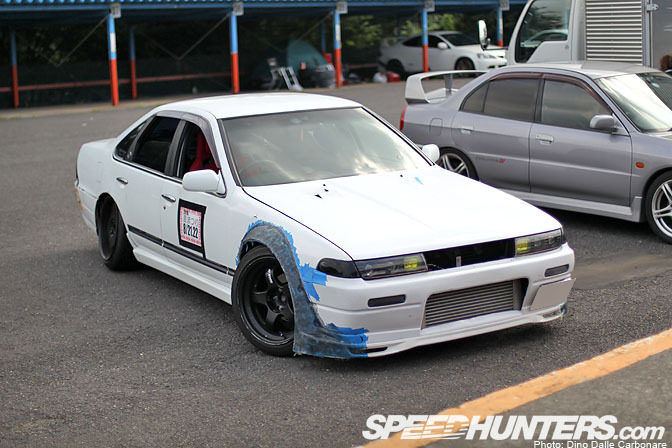 Saigo JZX still alive? what? 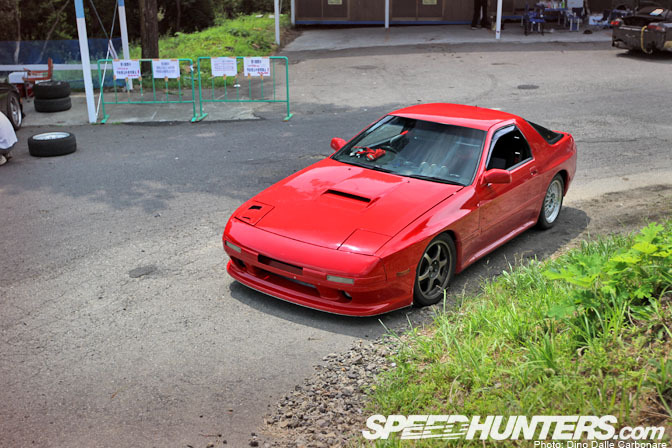 That car has been dead since the last matsuri. seriously Dino, I know you take amazing photographs, but despite its flaws thats one of my favorite pictures. 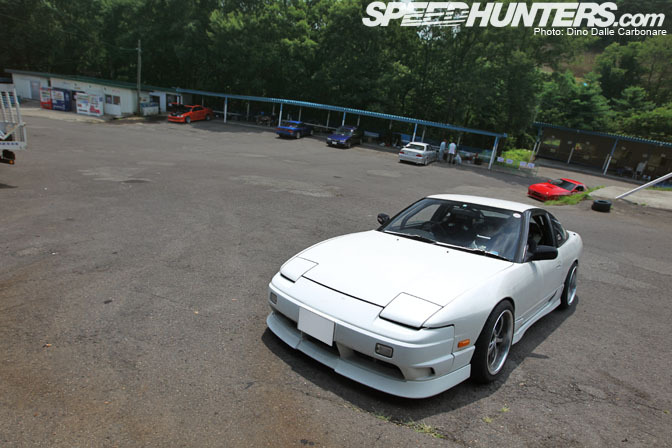 Just one car, an open track in ebisu with no one else in sight, and the sun shining. I need this in my wall!!!! Siiiiiiickness! I want more plz. Any shots of Noriyaro doing his thing? I can always count on Dino's coverage to lighten up my day! Beautiful pictures as always... I wouldn't mind a wallpaper of the blue Chaser. It looks so vivid! grill and headlights... i what a load of laffs. 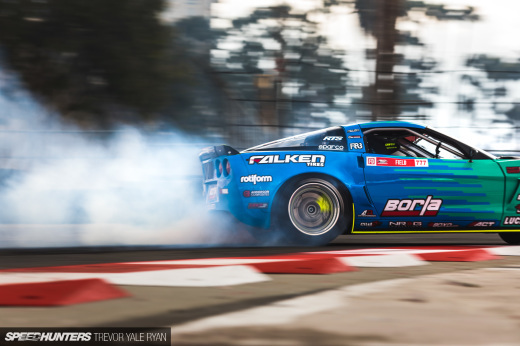 Missile Cars show the battle scars of the drifting madness! anyone video of chris de jager? ?